Many of our patients come to the clinic because they are suffering from symptoms of joint arthritis – this often leads to joint replacement surgeries of the knee, hip or shoulder. While this type of surgery is excellent for pain relief and joint function, the procedure itself is invasive with an involved surgical and recovery process. After extensive research of non-invasive methods of treating orthopaedic injuries, Dr. Olivia Cheng has focused on the use of FDA & Health Canada approved stem cell injection therapy for patient care. Stem cell injections are becoming increasingly popular in the treatment of orthopaedic injuries. Scientists and researchers are interested in stem cells because many of the cells have the capacity to serve any function after they are instructed to specialize. This property makes stem cells powerful enough to regenerate damaged tissue under the right conditions. What are stem cells? Adult stem cells exist throughout the body after embryonic development and are found inside of different types of tissue. These stem cells have been found in tissues such as the brain, bone marrow, blood, blood vessels, skeletal muscles, skin, and the liver. Adult stem cells can divide or self-renew indefinitely, allowing them to generate a range of cell types from the originating organ or structure i.e. stem cells help to create new cells in existing healthy tissues, and may help repair injured tissues. It is generally thought that adult stem cells are limited in their ability to differentiate based on their tissue of origin, but there is some evidence to suggest that they can differentiate to become other cell types. What types of stem cells exist? 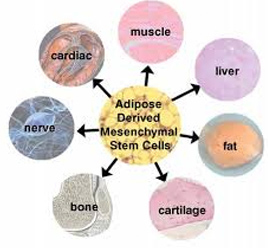 Scientists primarily work with two main types of stem cells: adult stem cells and embryonic stem cells. Adult stem cells are used in research and in the treatment of orthopaedic conditions. The most common (and probably the most studied) source for adult stem cells is the bone marrow. In the proper environment, they can differentiate into cells that are part of the musculoskeletal system i.e. bone, tendon, articular cartilage, ligaments, and part of the bone marrow. How are adult stem cells obtained? Patients will have fat removed via liposuction – the adipose tissue is then spun in a centrifuge to separate the stem cells. These cells are then re-injected using ultrasound imaging to localize the treatment to the injured area. The benefit of the injections often takes a few weeks, but to date, our patients are experiencing a very positive effect with stem cell treatments. If you have any questions about this non-invasive form of treatment, please contact us at the Orthopaedic Sport Institute. Have a question fill out the form below. It was 2 years ago today that I had a tragic accident and required surgery to repair the nerves and tendons in both my feet. I was referred here by a family member and quickly understood why they spoke so highly of the entire staff. From the moment I registered with the receptionist I felt welcome and comfortable. Darryl was my therapist and was very thorough and patient with me answering my many questions and explaining my treatment and assessment so that I could understand. With hard work and a lot of support and direction and treatment I was up and walking again ahead of schedule. I will always be grateful for the experience to be treated by this team of professionals and I continue to bring to my son here to be treated by the best! Todd Starr = Sciatica Whisperer. Thanks so much for helping me. I can't believe how much better I'm feeling. Amazing progress. Also, your staff give amazing customer service. I went to the clinic for the first time yesterday with a knee injury. I was impressed. They are very friendly, helpful and competent. They really care. I only have great things to say about them. Working with the great group of people at OSI over the last few months has changed the course of my life drastically after a motorcycle accident left me with extensive injuries. They have helped me develop my ability to heal and recover beyond a point I had not thought possible. The very motivating, knowledgeable practitioners and the friendly ladies at the front all help make an enjoyable experience on the road to recovery. I only wish I had come to them sooner! The clinic is a unique source of help and information. From Dr Cheng and Todd Starr at the top to the wonderful women on the reception desk I have found nothing but help and support. The people are well trained, knowledgeable and very approachable. The exercise classes are really helpful for strengthening and flexibility. I recently had stem cell injected into my knee and I feel as though the results are very encouraging. The follow up support and care during this procedure have been first class. I would recommend the clinic to anyone.